Like the bulk of material being released by our friends over at Pure Steel Promotion this is a re-release of a long-lost album. 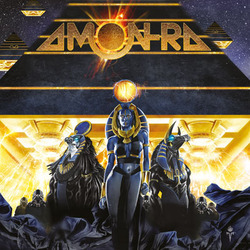 In this case it's Amon-Ra's sole album and it is going to be issued in a limited-run, vinyl format with 4 bonus-cuts. "In The Company Of Gods" was originally released back in 1992 on CD and still shows up for sale on Ebay. Now, because it featured Sacred Heart's Byron Nemeth I had high hopes for this album. Given that they also hailed from Cleveland, Ohio (and were purported to be this exceptionally talented traditional heavy metal/power metal/progressive metal outfit), had a novelty Egyptian theme, and featured member's of fellow-Cleveland power/thrash act Ground Zero (in this case Ken and Kris Dugan) all signs pointed toward a hidden gem. There is just one problem with Amon-Ra though. In a nutshell Dan Mattingly is not a very good singer. Even if musically this is only so-so to begin with (half of it sounds really inspired while the other half sounds hastily assembled) that could be overlooked. You can't overlook a bad lead singer though. His range is limited and, to be frank, his vocal style is rather monotonous. If you can look past that then you will want to scoop this up quick as there will be just 333 copies. If you are like me and bad vocals can ruin a good album then you should pass on this U.S. metal act. It's as simple as that. I wanted so bad to like this album, but it just doesn't cut it.